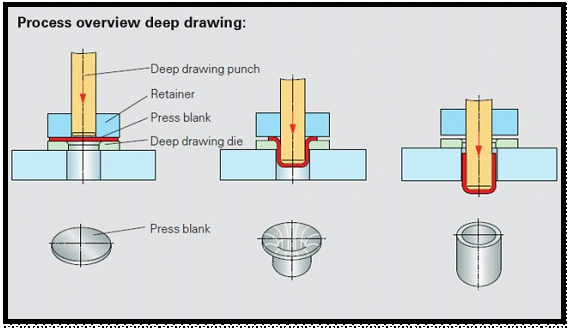 What is the difference between deep drawing and stamping ? Deep drawing stamping parts is now on the basis of an industrial production in place, in many areas will have a significant use. Simply put, deep drawing stamping is a special way of stamping in the production process is the use of the corresponding production equipment for non-conforming shape of raw materials for processing. But in the process and the general way of stamping there is a clear difference. The principle of deep drawing stamping is the use of the corresponding presses in the process of processing the need to produce the workpiece to exert external force, so that in the production process will occur material deformation, you can get a good we need Shape and size, but in the process of processing or the rest of the stamping method there is a certain difference. The first is the production of the mold, the production of deep drawing stamping parts will generally be divided into two parts of the mold, including the mold of the punch and die composition, in the production process generally a station will be placed on a Vice mold, there are many factories can even die into nearly 20 stations. Because in the actual production process we will use all the work as a basis, so that the production of products in the performance will be more stable. The second is the product of the tape, because the production of deep drawing stamping parts is not through the corresponding tape for transmission, but the use of the corresponding mold, built the corresponding manipulator is very good to drive the corresponding equipment for transmission, the robot The advantage of the series is that the equipment can be configured by its own adjustment, such as in the production process should pay attention to the equipment to rotate the operation of the various parts of the parts can be self-regulation. It is because more than the general process on the more details, so the whole device in the course of the use of the workpiece more stringent, especially the accuracy of the workpiece are so, deep drawing stamping parts are also better To complete the required properties, including in size, nature, and some special chemical properties. XY-Global is a custom manufacturer that specializes in wide-range of mechanical parts. Here is our website : www.xy-global.com .